This article compares multiple handheld units to wall-mount units, and discusses safety, performance, image quality, local regulations, and advantages and limitations. This is one article from the February 2019 issue of Clinicians Report. 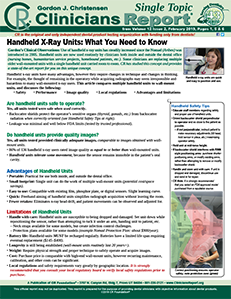 • Are handheld units safe to operate? • Do handheld units provide quality images? This is one article from the February 2019 issue of Clinicians Report. For the entire issue, please go to February 2019.